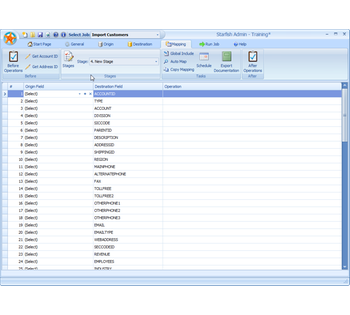 CRM Migration by StarfishETL SugarCRM, Inc.
StarfishETL makes it easy to migrate data between SugarCRM and other tools. The intuitive mapping and DIY platform give you the flexibility to move your data, your way. Use our Cloud migration wizard as a risk-free way to test your data and see results in real-time. Or, use our on-premises platform to customize fields and perform more complex migrations. If you need help, StarfishETL has a national partner network and a skilled support staff at your service. Our goal is to help you achieve migration success. Our prebuilt maps make it easy to migrate data from one CRM to another. Automatically map Accounts, Contacts, History, and more, with all standard fields mapped for you. Then, customize the mapping as needed for your CRM customizations. We have native CRM connectors for SugarCRM, Act!, Microsoft Dynamics CRM, Goldmine, Infor CRM, NetSuite, Sage CRM, Salesforce, Saleslogix, Vtiger, Zoho, and more. We support both REST and SOAP APIs for Sugar, so you are good to go for both Sugar 6 and Sugar 7. Customize our pre-built maps to account for custom fields in your CRM database. You can even transform data via functions and scripting if you want to clean your data as you migrate it.